At Pacific Northwest Periodontics we provide expert, full dental implant services with a focus on same-day implants and teeth replacement. 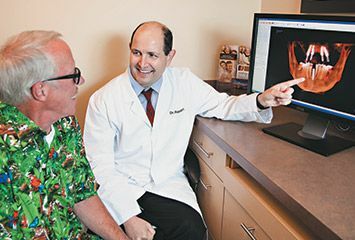 As periodontists, Dr. Rapoport and Dr. Schuler are specialists in dental implant surgery and treating the bone and gum tissues around your teeth. They deliver state-of-the-art dental implant treatment and can provide extractions, dental implants and immediate, functional replacement teeth in the same visit for eligible candidates. Dr. Schuler and Dr. Rapoport are dedicated to providing high-quality periodontal services for their patients. Dr. Rapoport and Dr. Schuler are both board-certified periodontists and Diplomates of the American Board of Periodontology, the highest status awarded for technical proficiency in their field. Only about 10% of periodontists have achieved this certification. They each have decades of experience with dental implants and stay abreast of all the latest developments in implant dentistry through regular continuing education. The comfortable armchairs in our waiting area, the warm greeting from our receptionist and the kind and attentive treatment by our doctors all contribute to making you feel relaxed and at ease. For your comfort, our front desk staff will offer you a choice of beverages when you visit. For added relaxation in the chair, we provide headphones, pillows and blankets. You can also request IV or oral conscious sedation, and for longer procedures, you can have general anesthesia with a certified anesthesiologist. 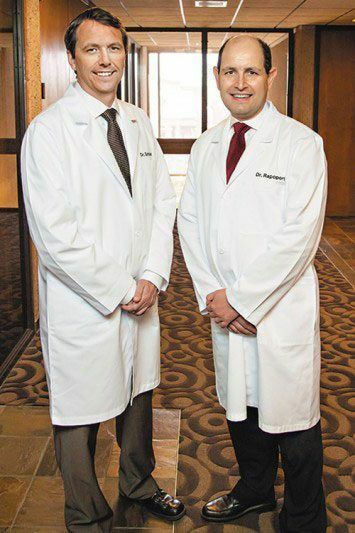 Dr. Rapoport and Dr. Schuler always take the time to really listen to you and understand your concerns and goals. They explain everything thoroughly so you know what is going on regarding your treatment options, and they will answer any of your questions. They make sure to give you the pros and cons of every option so you can make a well-informed decision and feel at ease with your treatment. Our doctors use advanced technology to meticulously plan out your treatment. Our doctors use the latest advances in dental technology for precise, minimally invasive and comfortable treatment. For diagnostics, they use a state-of-the-art 3D CT scanner which provides 3D images of your jaw and teeth in 360º view. Using these images, they meticulously plan out your dental implant treatment ahead of time. Our doctors also make a surgical guide that fits over your dental arch and marks the exact angle and placement position for each implant. For delicate micro surgical procedures, they use a special dental microscope that provides up to 20X magnification. 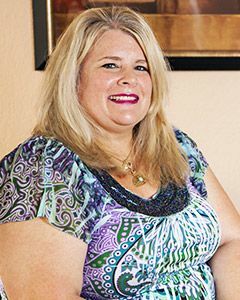 “I was so impressed with Dr. Rapoport and staff. They are so friendly and knowledgeable from the time you check in for your appointment.